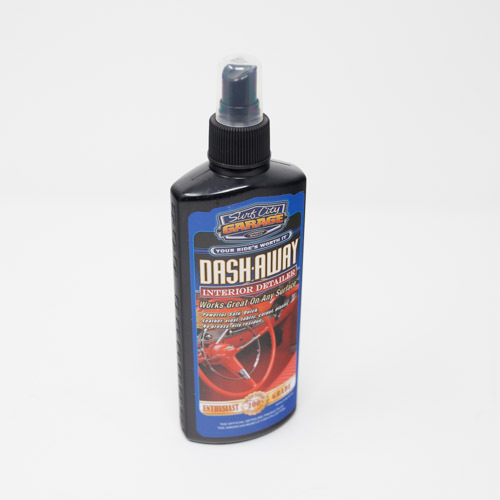 Clean up your dirtiest surfaces in your car with the Surf City Garage Dash Away Interior Detailer. This is an all-surface vehicle cleaner that also helps protect the interior of your vehicle. It offers a UV-protectant against the sun's potentially damaging rays. The grease stain remover will leave your interior looking clean and new. It comes in a 24-oz spray bottle for your convenience. The oil stain remover will wipe away with no greasy film wherever you may use it and is safe to use on most surfaces. It will remove dust, dirt and stains from interior surfaces, including cloth, leather and plastic. It is an ideal accessory to add to your garage, keep with your cleaning products or take with you in your car for emergencies.